Mr. Thompson orders April into his office to assign her a news story. It seems that the night watchman at Cybertech Laboratories spotted “some weird character hanging around” – Mr. Thompson is convinced that he must be a friend of “April’s Turtles.” Ms. O’Neil assures her boss that the character isn’t an ally of the TMNT and then she heads off to Cybertech Lab with mini-cam in hand. Meanwhile, down in the Turtles’ Lair, Donatello is displaying his new Super Pizza Maker. The other Turtles are impressed with its ability to make pizza in a matter of seconds, but when it is switched into high gear, the machine overloads and explodes, causing loose parts to scatter across the room. One of these loose screws hits Leonardo, causing “just a bruise.” Suddenly, April contacts the TMNT from Cybertech Labs via the Turtle Com, and informs them that Shredder, Rocksteady and Bebop are up to no good. While she waits for the Turtles to arrive (including Splinter, who is concerned about Leonardo’s injury,) April begins to videotape Shredder and his goons from the rafters high above the floor. O’Neil is spotted by Shredder, who sends Rocksteady and Bebop up after her. No sooner do the villains have the reporter cornered when the Turtles and Splinter arrive on the scene. The Turtles temporarily detain Rocksteady and Bebop so that they may rescue April, while Splinter deals with Shredder. Rocksteady and Bebop free themselves and randomly begin firing their laser weapons, hitting Cybertech’s computer consoles, causing them to malfunction just as Splinter and Shredder (independent of each other) are thrown onto platforms that look like the transporter platforms in STAR TREK. Suddenly, both Splinter and Shredder are engulfed in rays of energy, causing them great pain and discomfort. Rocksteady and Bebop, realizing that their boss is hurt, cause another distraction in order to rescue him. But when Shredder comes to, it is really Splinter’s mind inside of Shredder’s body – likewise, when Splinter regains consciousness, it is Shredder in Splinter’s body… and nothing would please him more than to return to the Turtles’ Lair! Splinter/Shredder arrives with a cold compress covering his eyes – because of it, he was unable to learn the secret route to the Turtles’ Lair – but undaunted, the villain plans to destroy the Turtles before he leaves. However, the TMNT become increasingly suspicious of their Sensei’s actions – actions that they feel are more appropriate for Shredder than Splinter. Meanwhile, Krang has come to the same conclusion regarding Shredder/Splinter and decides, after learning about the accident involving the ray, to give him a brain scan. Splinter is able to alter his mind, causing his brain waves to match Shredder’s. Krang apologizes and sends him, along with Rocksteady and Bebop, to retrieve the “Thermocupple-kalvinometer,” the very thing Shredder was sent to the surface for in the first place. Meanwhile, April arrives unexpectedly to see the Turtles, only to be unceremoniously thrown out by Splinter/Shredder. The Turtles have had enough and leave with her. Up on the street, they encounter Shredder/Splinter along with Rocksteady and Bebop. 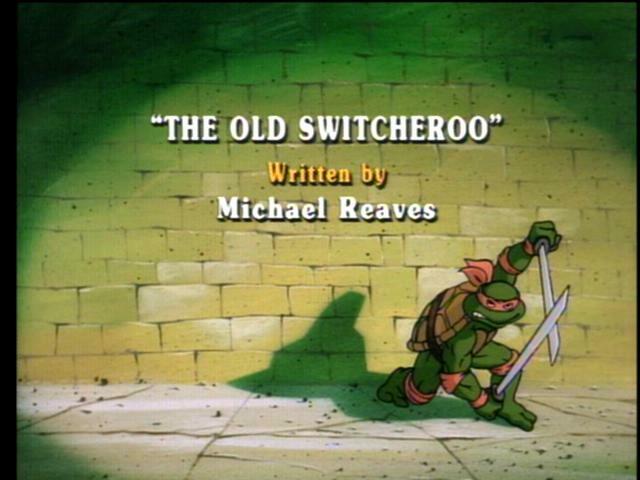 Rocksteady and Bebop are easily dispatched and then the Turtles turn their attention to Shredder/Splinter, who successfully convinces them that he is Splinter, whereupon Donatello suggests that if they can recreate the accident and reverse the polarity, they can put Shredder and Splinter back into their rightful bodies. Leonardo devises a plan that will lure Splinter/Shredder back to the Cybertech Labs by telling him that Shredder has returned. Splinter/Shredder believes this will be an opportunity to destroy the real Splinter once and for all. At the Cybertech Labs, things do not go as planned. Once again, Shredder and Splinter are zapped by the Mind Transferring Machine, but thanks to a blast by Rocksteady’s laser gun, the machine is about to blow up. Rocksteady and Bebop grab Shredder and beat feet, while the Turtles are uncertain as to who the real Splinter is. The TMNT gamble that the Splinter before them is the real Splinter, and return to their secret underground lair. Fortunately Splinter and Shredder were restored to their “normal” selves.